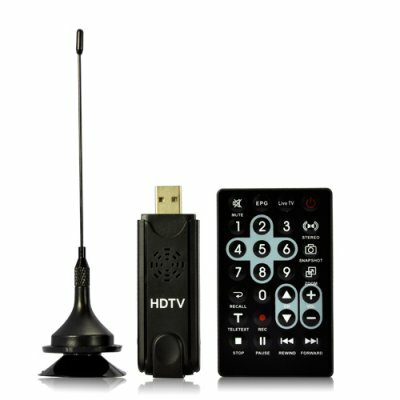 Successfully Added ISDB-T Full Seg USB Dongle - Free TV On Your Computer to your Shopping Cart. Watch free ISDB-T high definition (HDTV) and digital TV on your computer! This impressive USB dongle contains a powerful digital TV receiver that allows you to watch crystal clear high definition programming on your desktop PC, notebook, laptop, or netbook. Included with this USB dongle is a digital video recording (DVR) software package that lets you schedule recordings of all your favorite TV programs to watch whenever you desire. So for about half the price of your monthly cable bill, you can transform your average computer into a free high definition digital TV receiver plus digital video recorder! This incredible USB dongle is extremely easy for anyone to use. Simply install the included software CD, plug the ISDB-T dongle in to any USB port, open the DVR software, then sit back and enjoy hours of premium High Definition Television at your fingertips. The CVMK-K65 even comes with a remote so you can operate the receiver the same way you would a traditional TV. If your computer has an "A/V out" connection you can even send the digital TV signal to your primary television, so you can enjoy hours of free ISDB-T digital HDTV programming on not only your computer, but your big screen plasma TV as well! With the DVR software you will never have to watch boring commercials again. Simply "fast forward" past the commercials and watch only the program you intended to watch. You can also pause live television and record any program you want with the simple press of a button. If you are not available to record a program at a specific time, you can even schedule a recording to start and stop at any time frame you desire. The high quality video will be saved to your computers’ hard drive, so you can capture endless hours of TV programs, limited only by the size of your computers’ hard drive! The K65 USB dongle is designed to process ISDB-T MPEG-2 and H.264/MPEG-4 AVC encoded signals found in the following regions: Japan, Brazil, Peru, Argentina, Chile, Venezuela, and Ecuador. Save money and enjoy the best ISDB-T over-the-air broadcasting has to offer with the CVMK-K65. This exciting new product is available in bulk or single piece orders and is in stock and ready for immediate shipment. Place you orders today and start enjoying all the amazing benefits of free ISDB-T programming! Evaluate the included basic ISDB-T software for yourself. You may decide you need more advanced features, in which case we recommend that you try out some of the popular open-source titles or purchase a commercial DVR software package. Which ISDB-T standard is supported with this tuner, MPEG2 or MPEG4 (H.264)? This unit supports both MPEG-2 and H.264/MPEG -4 AVC broadcasts. Can I use different DVR software with the CVMK-K65? You can use any software you desire. Note: We can not guarantee compatibility with all DVR software packages.